This year, Fat Quarter Shop is hosting the Threadology Quilt Along! This quilt pays homage to the thread that holds us all together. We are happy to support Make-A-Wish with this online quilt along. We will post the fabric requirements for the quilt and all the FREE patterns for download on our Threadology blog page (https://blog.fatquartershop.com/threadology-quilt-along). From February through June 2019, we will post the free block and finishing patterns on our blog to download and print on the 1st and 15th of the month. 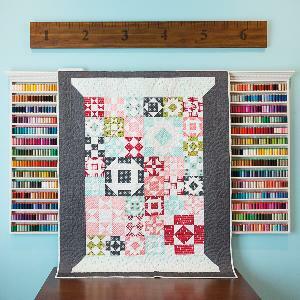 We will also post video tutorials to show how to make this quilt to correspond with the patterns. We ask that you donate $5 to our MAW Fundraiser for the use of each free pattern. Fat Quarter Shop is partnering with Moda Fabrics to match up to $10,000 each of donations raised during the 2019 calendar year. We encourage you to max out our company match! Threadology Quilt Kits and Backing Sets are available for sale at www.fatquartershop.com, and they are filled with fun exclusive items. But, if you wish to sew along with other fabrics or from your fabric stash, please use the fabric requirements we will be posting on January 14, 2019, as a guide to prepare for the quilt along. Post your progress, creations and stories on social media with #threadologyquiltalong. Fat Quarter Shop will also be giving away some sweet prizes throughout the quilt along, so please join us!